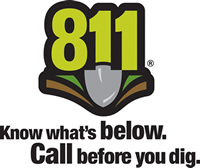 811 is the new number you should call before you begin any digging project. Homeowners often make risky assumptions about whether or not they should get their utility lines marked, but every digging job requires a call – even small projects like planting trees and shrubs. If a utility line is cut or damaged and 811 has not been called, the person damaging the line is responsible for repairs, and is liable for all costs associated with emergency response, property damage, repair of the utility, and utility products (water and natural gas) lost because of the damage or break. Total costs can run into hundreds or thousands of dollars, plus you could spend a day in the dark, without water or TV! And that can be avoided with one phone call!